Social video expert Unruly reviews the latest viral by Quiksilver. It’s always exciting when a marketing opportunity produces genuine innovation. Think back to 2011, when Nike announced mass production of the Air Mag, the long-fabled trainers featured in 1989’s Back To The Future 2 and the nostalgia-fuelled internet rejoiced. Of course, the 2011 Air Mags crucially lacked the sci-fi power-lacing of Marty McFly’s pair, and you needed a small fortune to buy them, but that didn’t matter. Creating a themed, proudly-gimmicky product like retro-future sneakers is a way for a brand to show off its sense of humour, and appeal to everyone’s inner child. And, of course, produce some top-notch video advertising. So it goes with ‘True Wetsuits', the latest marketing drive from surfing brand Quiksilver. While its concept doesn’t have the built-in audience that ‘Back To The Future’ does, the idea is as brilliantly simple. 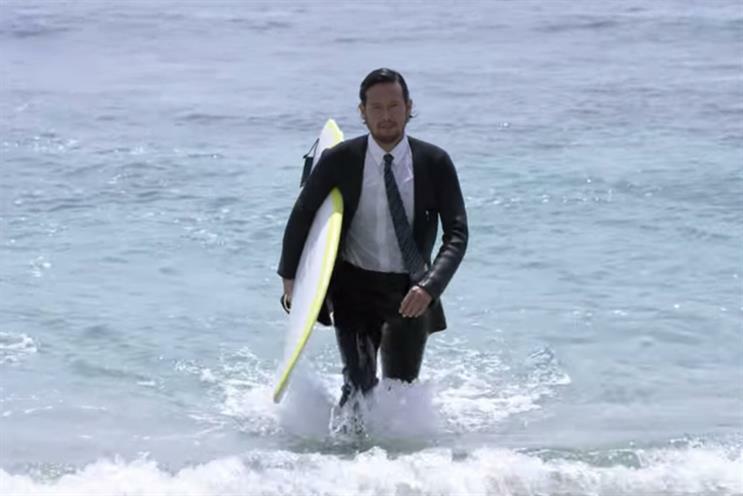 Spotting a gap in the market for boardroom surf enthusiasts, the brand decided to create a line of neoprene wetsuits in the style of Savile Row-ready business attire. Complete with shirt, tie and slim-line trousers, it’s simultaneously the silliest and best idea a major brand has had for ages. With ‘True Wetsuits’, Quiksilver suggests that business people have been clamoring to surf in their work clothes for years, but only technical difficulty and dry cleaning costs have held them back. It’s this wide-eyed earnestness that makes the whole campaign a joy. Produced by Tokyo-based agency TBWA\HAKUHODO, the accompanying video campaign fleshes out the ‘boardroom to beach’ fantasy. The ad begins with a dapper businessman crossing a bridge on his way to work, all of a sudden distracted by the allure of the crashing waves below. Taking a different kind of executive decision, he swings his car around and hightails it down to the sand. Now, if this were any ordinary pre-work surf excursion, an awkward montage would ensue as our hero wrestled in his floppy wetsuit. Not so with the ‘True Wetsuit’. Simply grabbing his trusty board, he dashes, Bond-like, into the rollicking waves. Where ‘True Wetsuits’ succeeds most is on visual gimmickry. Whether you care about surfing or not, there is something legitimately pleasing about seeing someone in a sharply-tailored suit zipping up and over crashing waves. This is probably the reason the spot has received so much press coverage; it’s a beautifully eye-catching image that lives up to the promise of its concept. While the spot is not entirely innovative, playing in parts like a besuited episode of ‘Baywatch’, the business wetsuit concept is inherently shareable. And this is borne out in its online popularity, racking up 20,000 shares on Unruly’s Viral Video Chart since its release earlier this week. As with Nike’s momentous Air Mag launch, these kind of campaigns are less about the number of items sold and more about the online hype generated. While there may be a few Silicon Valley surf dudes willing to cough up $2,500 for a novelty wetsuit, the True Wetsuit hardly has widespread appeal (even if it does come in business and tuxedo versions). Injecting a dash of bespoke charm into a world normally associated with flip flops and bucket hats, ‘True Wetsuits’ has certainly achieved the aim of bringing a little class to surfing. And as far as showing the world that Quiksilver is ready and willing to put effort into cracking smiles with a ridiculous ‘What If...’, the brand has undeniably succeeded.